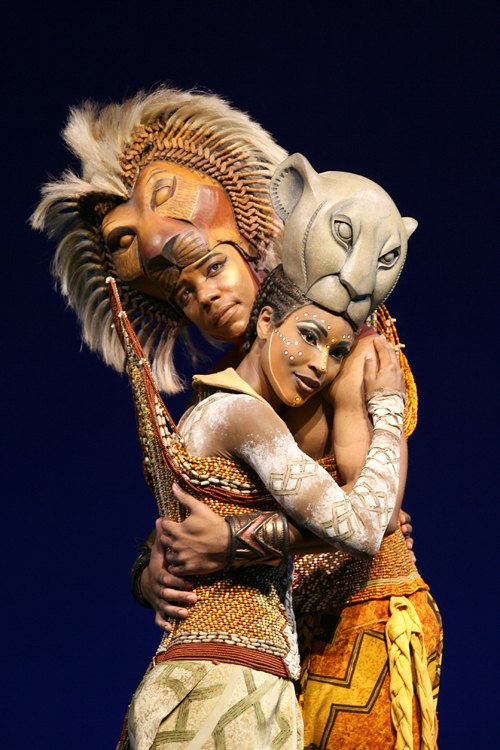 It took an entire kingdom of 51 human lions, antelopes, elephants, giraffes, zebras and birds to turn even the most cynical high-brow theatregoer into a soft-hearted whelp. Granted, it had the makings of a contrived musical from the Elton John songs and the awe-inspiring African drum beats and arrangements. And lest we forget the musical is based on a Disney movie. 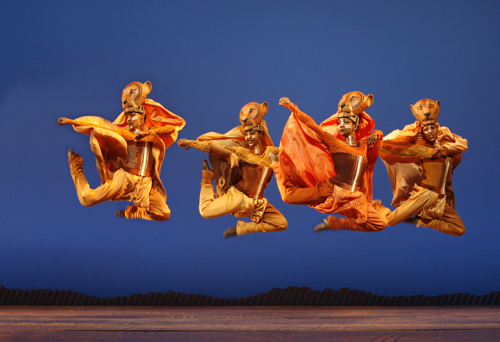 As the priestly baboon Rafiki (Gugwana Dlamini) called on the safari animals chanting “Nants’ Ingonyama Bakithi Baba” in the opening number ‘The Circle of Life’, the ensemble dressed from cheetahs to zebras galloped, strutted and pranced down the theatre aisle onto the stage in flamboyant procession. You could hear the audience gasping in wonder and mouths gaping in awe at the life-sized costumes in splendid display and fluid motion. The actors, or rather puppet masters, controlled the costumes as if they were one. Consider the giraffes walking on stilts to create the illusion of height; the antelopes moving gracefully in a bicycle-like contraption and the lions’ masks inching forward nobly with every quivering neck muscle. The celebratory mood was palpable right from the start, setting the tone for the evening and dispelled any misguided cynical leanings, including one of its director Julie Taymor, who is also helming the critically-panned Spider-Man production currently spinning out of control on Broadway. But judging from the catcalls and howls (pun intended), there’s really nothing to worry about – Hakuna Matata! Mirroring the good-versus-evil premise of the movie, the audience kept up easily. Mufasa (Jean-Luc Guizonne) is the king lion and leader of the Pridelands killed by his brother Scar (Patrick Brown). Simba (Jonathan Andrew Hume) is the heir to the throne, who fled upon his father’s death and returns later to take over the kingdom. The standout performances included meerkat Timon (Jamie McGregor), warthog Pumbaa (Pierre van Heerden) and horn billed bird Zazu (Lyall Ramsden). Timon and Pumbaa, wisecracks characters, had the audiences in stitches with their farting gags and zippy liners thanks to their chemistry, or some called it, animal instinct. 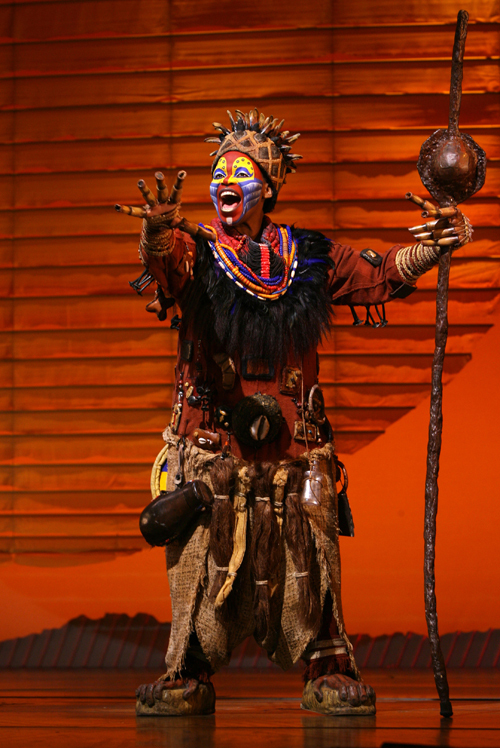 Similarly, look out for Rafiki in the second act where South African actress Dlamini performed the heart-warming number ‘He Lives in You’. Dlamini’s grave and booming voice evokes and stirs the heart, a hair-raising feeling for the audience. Zazu was also impressive with Ramsden in masterful control of the creature fluttering wings, nuzzling its beak and singing in a birdlike voice. Ramsden’s facial expressions were flawless, in sync with the bird’s movement at every pace and turn. Ramsden even brown-nosed the local audience with a quick rendition of ‘Rasa Sayang’, the popular Malay folk song, at one point. Indeed, the musical was peppered with Asian flavours from actors mouthing Singlish to performances of wayang kulit (Indonesian shadow puppetry). Featuring an international cast, the musical is as diverse and contemporary as it gets with sentimental favourites (‘Can You Feel the Love Tonight’) and rock numbers (‘Be Prepared’ sang aptly by the maniacal hyenas). Besides the amazing costumes and puppetry, the sets were equally magnificent and contributed to the theatrical experience. The night sky was transformed into a twinkling display using visual effects; the wildebeest’s stampede at the gorge a clever trickery of craftsmanship and imagination; and the reappearance of Mufasa glowing in the darkness had the audience cooing in pleasant surprise. The musical, which debuted in Broadway way back in 1997, arrived just in time to remind any jaded theatregoer that there is still magic on stage. The visual spectacle put together by an energetic ensemble in riotous costumes amidst dramatic sets coupled with soulful songs and excellent puppetry-acting is made for the theatregoer who appreciates artistry, possesses a rich imagination, and believes in the magic of the theatre. The animal kingdom is alive. 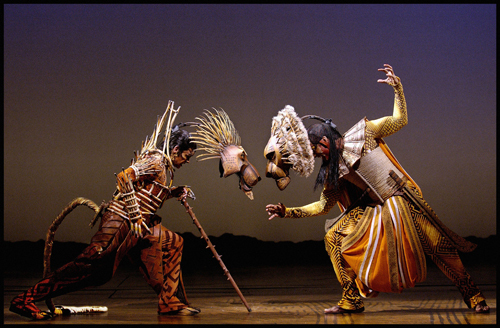 The Lion King is showing at Marina Bay Sands Theatre. Tickets are available at Sistic from $65. All photos are courtesy of Base Entertainment Asia. Avenue Q: For Adults Only!